Have you heard? Close to My Heart My Acrylix (clear) stamps are 10 years old! To celebrate, they are offering the "Deal of the Decade." If you've been hearing about Sticky Boy, he is the first Acrylix Stamp created to prove that he can stick to anything! He's traveled a lot and has been our stamp mascot for 10 years! He has his own adorable Facebook page. Hop on over there and let them know that Lalia sent you! 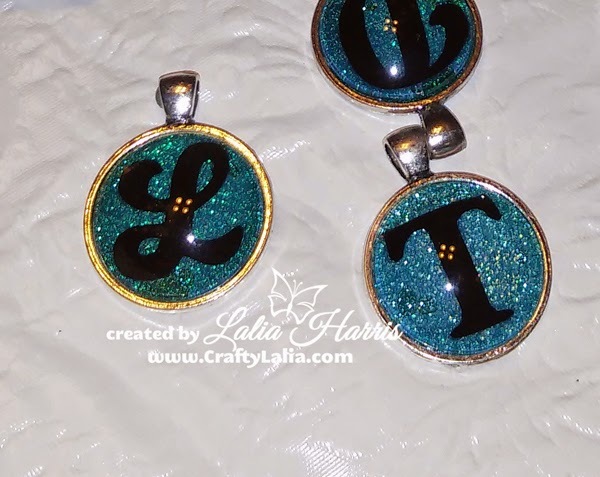 Please tag me or my Crafty Lalia Facebook page to let them know I sent you. When you have a qualifying purchase of $50, you can add any of the C & D sized stamps from the Annual Inspirations Catalog for just $10 each. They're regularly $13.95 & $17.95. There are a few that don't qualify because they're not in the Annual Inspirations. They may be BRAND NEW for the 2014 Seasonal Expressions catalog or older ones from previous catalogs. Don't worry, they can help you qualify for the $50. Here's a peek at all of these stamp sets. You'll be prompted to add the $10 stamps to your cart when you have $50 in your shopping cart. Click the Deal of the Decade link to start adding them. This Deal of a Decade is available all month long but don't wait until it's too late. When you kiss your sweetheart happy 2015, the deal will be over. As always, with any $50 purchase you can get the Stamp of the Month for just $5. This one is particularly great! 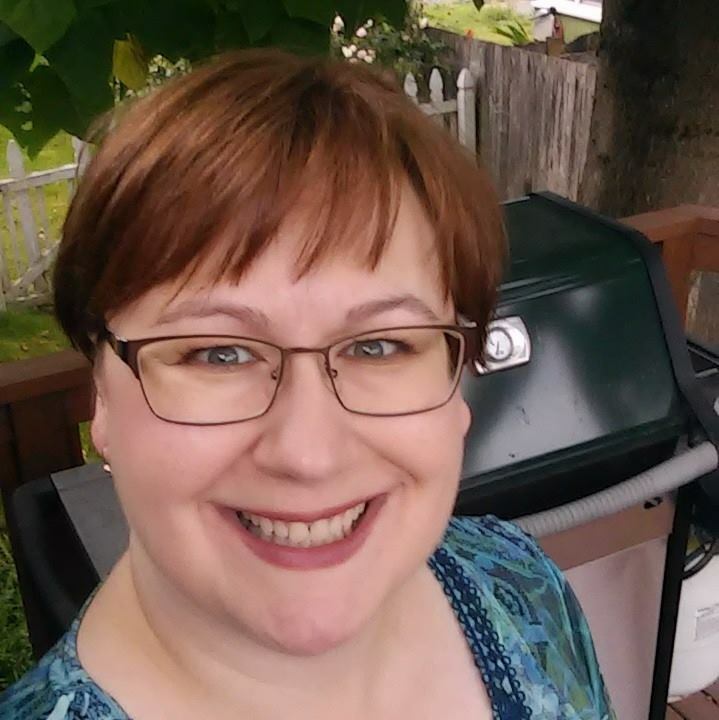 Welcome to the Seasonal Expressions 1 blog hop! If you're already hopping, you've just come from Michelle's blog. If not, you can start here and hop all the way around the circle. The Seasonal Expresions is a 38 page "Bonus catalog" that's available now thru March 31st. It features 2 new paper packs, a whole bunch of fresh spring stamps and new hostess rewards exclusive items. Tonight, I'm featuring the Hostess Exclusive stamp set "Variety of Thanks" that's only available during this catalog. Not only is it exclusive, it's only available for FREE or only $6 of your Hostess Rewards Dollars! I've been wanting a thank you stamp set for a bit and this one is perfect! These were so simple to make. It took about 90 minutes for 3 of us to assemble & package THIRTY-TWO of these as gifts! Pretty fast and economical too! 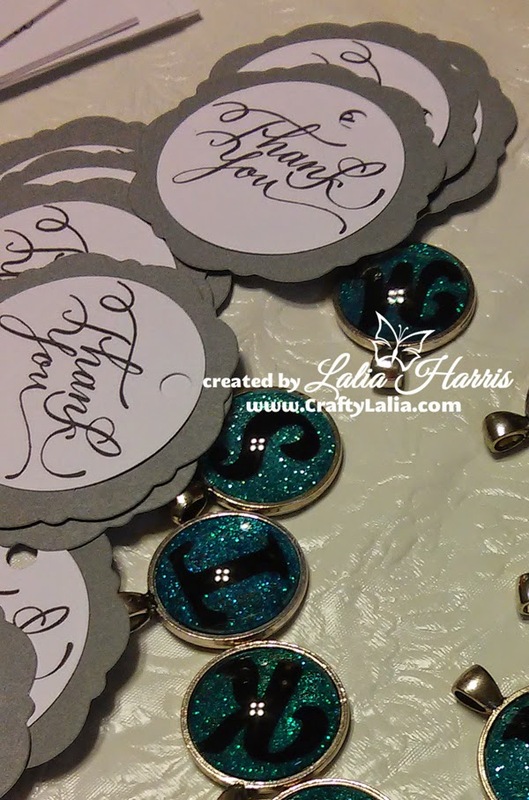 Kristi punched 1" circles from our teal glitter paper. I had already cut the initials from black paper. I used Cricut Craft Room to make sure each letter would fit inside a 0.90" circle. Most letters ended up being 0.80 inches. Most letters were cut from the elegant Artbooking font. A few letters were cut from Art Philosophy. The T & G weren't easily recognizable in Artbooking. Kristi & I assembled the base & bling. We pressed the glittery circle into the round pendant, centered the letter, added a bit of liquid glass and the glass dome. Lots of baby wipes were used. Libby stamped the Thank You in black ink and then punched out the image with a 2" circle punch and mounted it on the 2.5" fancy scalloped circle. Together we packaged them up without the zipper pulls. Whoops! Which is why I don't have a picture of the clip. Fortunately we weren't too far into the process. 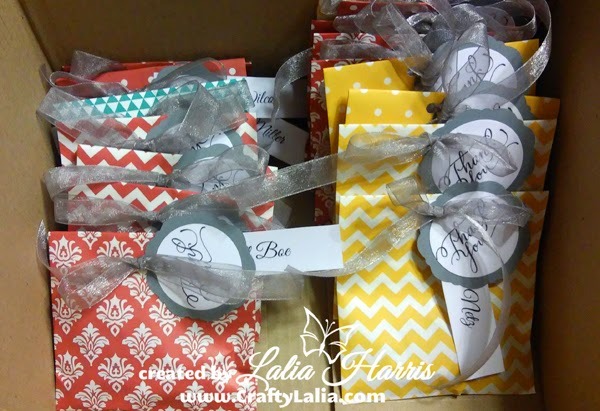 We used our cute little Designer Creations paper bags to package them up. This sure beats cutting out 3 dozen cute boxes on the Cricut. Economical, fast & adorable! I used a standard 1/4" hole punch to punch two holes in the paper and a single in the tags. 18" of ribbon made a nice bow with this lightweight ribbon. The ribbon was from my stash. Here's most of the gifts ready to go. 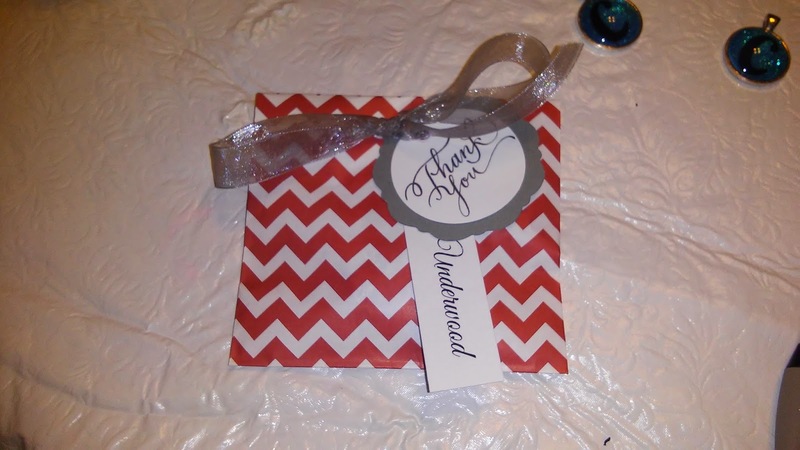 We used the Lagoon, Ruby & Honey paper bags. You can purchase them here. If you love this stamp set as much as I do, contact me on how to obtain it. You can't buy it! That's all for now, please hop on over to Donna's blog to see her amazing project. We're using a half package of Ruby Mini Medley Accents and a whole bunch of clear sparkles to accent the Snowhaven paper and chipboard complements. This month's sampler does not include any extra cards or tags. You'll have a few pieces of chipboard left over but they are very Holiday themed. It's not my intent for you to create something that you won't use for another 11 months. I'll need your RSVP & payment of $16 for the January Sampler no later than December 19th if you're attending the Saturday evening workshop on January 3rd. You can mail me your payment or we can do it via PayPal. Click here to contact me. Workshop To-Go Kit with $6 shipping. Order any time. Shipping is $6 within the US, no matter how many kits I send (I'll pay the difference if needed). Feel free to order two months of kits or a second kit to complete with a friend. Stay tuned, I'll be publishing the February Valentine's Seasonal Sampler this month as well. In the meantime, Merry Christmas!